Beautiful bat mitzvah invitations are one ingredient in making sure the day of your daughter's bat mitzvah is a special one. There are many different options for invitations, from traditional to modern, so finding the perfect design for your occasion should be a breeze. If you want to make your own invitations, these samples can be downloaded and personalized for your event. If you need help downloading them, check out helpful Adobe tips. This first option has a feminine feel with its watercolor flowers and is perfect for a spring or summer occasion. The next option honors the religious purpose of the ceremony with the Jewish star border. Invitations 4 Less: On this site, you can order personalized invitations with any wording you would like to include. They also have a few wording examples if you're stuck for ideas. If you prefer to go for a basic, stock invitation, you can find those as well. eInvite: eInvite has a good mix of modern and traditional invitation styles, and what is nice about this service is that you can download a template and print the invitation yourself at home. There's no need to wait for delivery. Do some window shopping at the following online retailers to see what catches your fancy. Step one in the invitation selection process on the Majestic Invites website is to decide if you want "scroll, flat card, or one of a kind" designs. From bejeweled invitations to one-of-a-kind designs conceived by you and their design team to invitations that are delivered to your guests as beautifully-packaged scrolls, these party calling cards could never go unnoticed. Go as simple or as elaborate as you want, just be aware that the price increases as you add more flair to your invites. Some people think that all of the hubbub surrounding bat mitzvah parties has moved the focus away from the real meaning of the event - that the young lady has reached the age of religious maturity. If that sounds like your take on the modern bat mitzvah, then Elaine Adler's invitations are for you. With Hebrew calligraphy and Torah verses, these invitations still look beautiful but stand as a reminder of why everyone is celebrating in the first place. You can buy pre-designed invitations on this site or have your own custom made, in keeping with the religious theme. For the ever-so-stylish bat mitzvah honoree, there is Tiny Prints. This company has cute and modern invitations that are a million miles away from frumpy. You can even choose to include a photo of the celebrant right on the invitation. With 64 different options and a fast delivery time, it's hard to go wrong when shopping on Tiny Prints. For those who want to use Tiny Print's mailing service, stamps are free. When simple or unique invitations aren't fitting for the celebration you're planning, look for an elegant option. Elegance is never out of place at a bat mitzvah celebration. 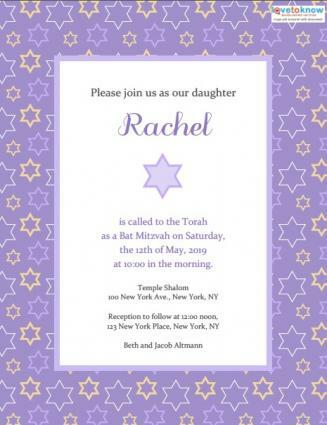 For bat mitzvah invitations that highlight the religious aspects of the occasion, look to Carlson Craft. This site offers beautiful, classic invitations with Jewish artwork such as Torah scrolls, Israeli towns, the Tree of Life, and watercolor Jewish stars. The site also offers online proofs and 24-48 hour turnaround for orders, which is perfect if you've fallen a little bit behind schedule. The name says it all. Invitation Elegance has their own line of classic, gorgeous bat mitzvah invitations you can order directly from them, and they also have links to some other striking invitations from around the net. 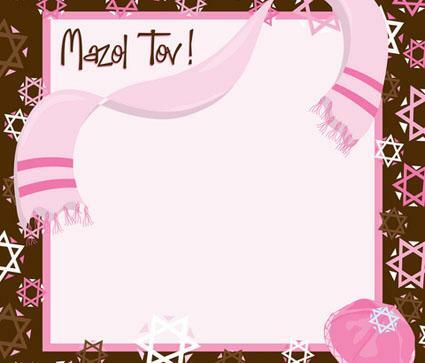 They can personalize any invitation you order with information about your bat mitzvah party in your choice of script. They can get your finished invitations to you in about a week. Checkerboard features plenty of gorgeous bat mitzvah invitations. Choose from classic, contemporary, feminine, watercolor and religious designs. You can choose from stock styles or customize one of your own. Invitations are printed on premium crafted paper with your choice of raised ink. Envelopes are included. Bella Figura offers stylish and modern letterpress invitations. These invitations will impress your guests with their elegant design. Search over 200 invitations that can be personalized into a custom invite and consider some of Belle Figura's green printing options such as tree-free paper. You can also get Belle Figura to make you matching custom postage stamps. 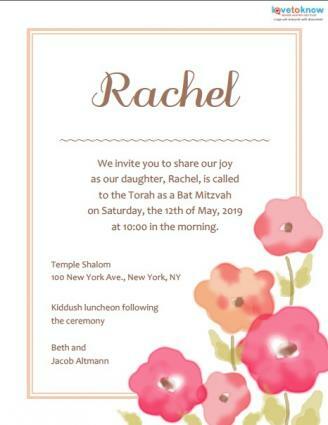 Bat mitzvah invitations are generally worded so that the parents are inviting the guests. Invitations also generally have both the bat mitzvah's English name and Hebrew name. The wording is usually simple, and most commonly states that the daughter is "being called to the Torah as a bat mitzvah." This phrase may seem bizarre, but bat mitzvah literally means daughter of the commandments, so while the ceremony is called a bat mitzvah, the young woman is actually becoming a bat mitzvah as well. Rebecca Anne becomes a bat mitzvah. Saturday December 13th, 2012 at 10 a.m.
RSVP to Sarah by November 20th at 123-123-1234.
is called to the Torah as a bat mitzvah. Reception to follow at 1 p.m. In many ways, an invitation to your daughter's bat mitzvah should be similar to the kind of invitation you would send out to any event. It needs to include important information, such as the when and where, about the occasion that your guests will need to know and you should use formal invitation wording. People who have not attended bat mitzvahs in the past may also have questions about whether or not they should bring a gift, and if so, what kind of gift would be appropriate. Some people do include information about gifts on their invitations, but it's generally not in the best taste to do so (unless you are specifying "no gifts"). If you anticipate people might have these kinds of concerns, you could include a phone number and email address on the invitation and invite people to contact you with any questions - you can simply make this a part of your RSVP. 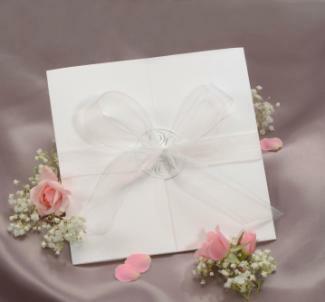 No matter what design you prefer, the perfect invite will spread the word about your daughter's big day in style. Be sure to give yourself plenty of time to order the invitation and get it out to your family and friends.